Background/Aim: The goal of antiviral therapy for chronic hepatitis B (CHB) is to improve survival of the patients by achieving a complete virological response (CVR). This study aimed to evaluate long-term efficacy of entecavir (ETV) and tenofovir disoproxil fumarate (TDF) in nucleos(t)ide analog (NA)-naïve and NA-experienced Korean patients with CHB and to determine the incidence of cirrhosis-related complications in these patients. Patients and Methods: We retrospectively reviewed medical records of all patients treated with ETV or TDF from July 2007 to January 2017. We examined CVR and analyzed the predictive factors influencing the rate of CVR and evaluated the incidences of cirrhosis-related complications. Results: The proportion of patients who achieved CVR was 94.2% in the ETV group and 91.1% in the TDF group (P = 0.358). Among patients who achieved CVR, the mean time to CVR was 13.5 ± 14.3 months in the ETV group and 11.5 ± 10.6 months in the TDF group (P = 0.169). Positive predictive factors for CVR included the current treatment with TDF, a low hepatitis B virus DNA level, negative hepatitis B e-antigen status, and high alanine aminotransferase level in baseline laboratory test. The annual incidence rate of HCC was 127 per 10,000 patient-years (1.27% per year) in ETV group, and 85 per 10,000 patient-years (0.85% per year) in TDF group (P = 0.526). Conclusion: Both ETV and TDF therapy resulted in a high CVR, and the annual incidence rates of HCC and other cirrhosis-related complications were not significantly different between the two treatment groups. Globally, approximately 240 million people have chronic hepatitis B (CHB), with a varying geographic prevalence, which is the highest in Africa and Asia. In South Korea, the prevalence of CHB was high in the past (6.6%–6.8% in the 1980s and 5.7% in the 1990s) but has been reduced by vaccination for hepatitis B virus (HBV).,,, In 2012, the Korean Ministry of Health and Welfare announced that CHB prevalence was approximately 3.0% among Koreans. Despite marked improvement in its prevention, CHB is still a major health problem, and approximately 60% of hepatocellular carcinoma (HCC) cases are HBV-related. Approximately 25% or more of patients with CHB eventually suffer from liver cirrhosis (LC), and the incidence rate of HCC in patients with CHB is about 0.8% per year. To control progression of HBV-related liver disease, international guidelines recommend either an injection of pegylated interferon (PEG-IFN) or long-term oral administration of third-generation nucleos(t)ide analog (NAs) such as entecavir (ETV) or tenofovir disoproxil fumarate (TDF)., However, treatment using IFN is commonly complicated by various side effects and is contraindicated in patients with decompensated HBV-related cirrhosis, autoimmune disease, uncontrolled severe depression or psychosis, in those receiving immunosuppressive therapy or chemotherapy, and in female patients during pregnancy. In treatment of CHB, TDF and ETV cause more powerful viral suppression and induce fewer resistant HBV mutants than other antiviral agents do. These drugs can be used in most of compliant patients and show good safety profiles.,, Therefore, it is important to assess treatment results in patients treated with ETV or TDF. There have been some real-world data reported on the efficacy of ETV and TDF., However, there have been no real-world single-center data on the predictors of complete virological response (CVR) and on complications and HCC developed during ETV and TDF treatment. We studied long-term efficacy of ETV and TDF in NA-naïve and NA-experienced Korean patients with CHB and evaluated predictive factors affecting CVR and incidence rates of HCC and cirrhosis-related complications. This retrospective cohort study included patients who received ETV or TDF at Kyung Hee University Hospital, Gangdong, Seoul, Korea. We reviewed electronic medical records of 550 patients with CHB who were treated with ETV or TDF from July 2007 to January 2017. The exclusion criteria were as follows: (1) antiviral therapy for less than 24 months, (2) pretreatment serum HBV DNA level of less than 2000 IU/mL, and (3) incomplete electronic medical records. Since this study was a retrospective analysis of existing administrative and clinical data, informed consent was not acquired. This study was approved by the Institutional Review Board of Kyung Hee University Hospital at Gangdong (IRB file no. 2017-08-005). Data were collected from patients' electronic medical records and included clinical information, and laboratory data at the initiation of treatment. Patients' medical history such as LC, hypertension, diabetes mellitus, malignancy, chemotherapy, and immunosuppressive therapy was included in demographic data. All patients were followed up every 3 months with biochemical and virological assessments, which included status of hepatitis B e-antigen (HBeAg), serum HBV DNA levels, and other blood chemistry parameters, including hemoglobin, platelets, aspartate aminotransferase (AST), alanine aminotransferase (ALT), international normalized ratio of prothrombin time, protein, albumin, creatinine, and alpha-fetoprotein (AFP). CVR was defined as an HBV DNA level of less than 20 IU/mL, as determined by a quantitative polymerase chain reaction assay., Diagnosis of HCC was based on imaging tests such as four-phase computed tomography (CT), dynamic contrast-enhanced magnetic resonance imaging (MRI), and/or biopsy. In CT or MRI, a dynamic image showing arterial uptake of contrast media, followed by venous or delayed-phase washout of the contrast, was used for diagnosis by imaging techniques., Diagnosis of LC was made based on clinical, radiologic, laboratory, endoscopic, and histological findings. When characteristics of cirrhosis existed on radiologic and endoscopic evaluation, liver biopsy was not performed to diagnose LC. Cirrhotic configurations of the liver on radiologic evaluation included nodular liver surface, splenomegaly, and intraabdominal collaterals, which represented portal hypertension. The cirrhosis related endoscopic remarks included esophageal and gastric varices and portal hypertensive gastropathy. Our study checked the cirrhosis related complications including variceal bleeding, ascites, spontaneous bacterial peritonitis (SBP), and hepatic encephalopathy. Continuous variable values were reported as mean ± standard deviation, maximum, and minimum values. We used t-test or Wilcoxon rank-sum test to compare continuous variables between ETV and TDF groups. Categorical variable values were reported as a number and percentage, and we used the Chi-square test or Fisher's exact test to compare categorical variables. We performed multivariate Cox regression analysis to identify predictive factors affecting CVR. Statistical analysis was performed using SPSS statistics software for Windows, version 19.0 (SPSS Inc., Chicago, IL, USA). A two-sided P value < 0.05 was considered to indicate statistical significance. Among a total of 550 patients, 247 patients who received antiviral therapy for less than 24 months (n = 117), had pretreatment serum HBV DNA levels of less than 2000 IU/mL (n = 86), and had incomplete electronic medical records (n = 44) were excluded, and the final sample included 303 patients. Among patients included, 191 patients who took 0.5 mg of ETV a day were classified into an ETV group, and 112 patients who took 300 mg of TDF a day were classified into a TDF group. In ETV group, 165 patients were NA-naïve. The remaining 26 patients were divided into three groups based on the treatment experience status as follows: Lamivudine-resistant (LAM-R; n = 12), adefovir-resistant (ADV-R; n = 2), and suboptimal response (n = 12) groups. In the TDF group, 70 patients were NA-naïve. The 42 treatment-experienced patients were divided into four groups based on the treatment experience status as follows: LAM-R (n = 11), ADV-R (n = 6), ETV-resistant (ETV-R; n = 13), and suboptimal response (n = 12) groups [Figure 1]. [Table 1] summarizes the baseline clinical and laboratory characteristics of the two treatment groups. The mean age of the patients was 48.3 ± 11.8 years, and the majority of patients were males (61.4%). The median duration of the treatment was 50 months (interquartile range, 35–72 months). There were a few differences in baseline characteristics between the groups. Those treated with ETV had a longer duration of current medication than those in the TDF group (66.6 ± 26.8 months vs. 38.5 ± 9.2 months, P < 0.001). The ETV group had a larger proportion of NA-naïve patients than the TDF group (86.4% vs. 62.5%, respectively, P < 0.001) and a larger proportion of patients with no resistance to NAs compared to that in the TDF group (46.2% vs. 28.6%, respectively, P = 0.003). 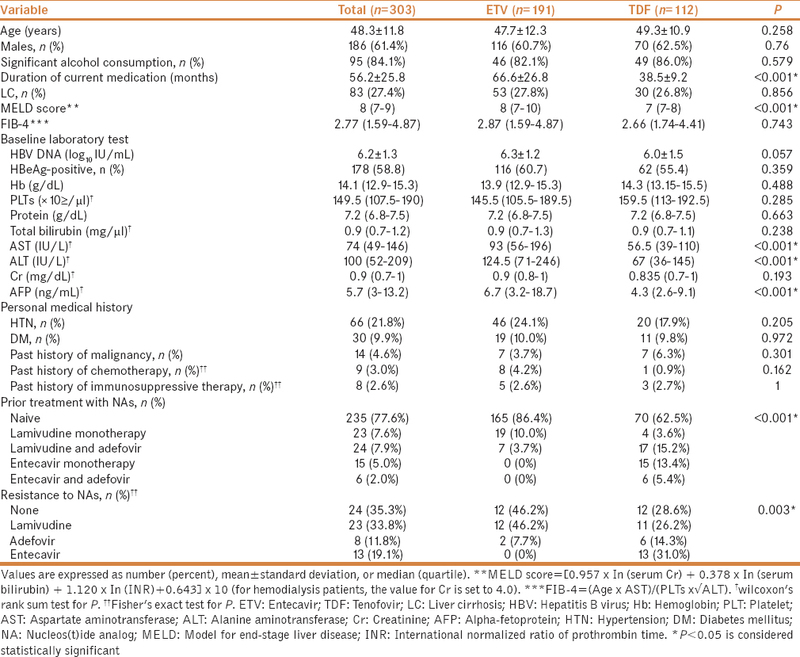 ETV group had significantly higher values than those in TDF group (P < 0.001) for the model for end-stage liver disease (MELD) score (8 vs. 7, respectively), as well as for AST (93 vs. 56.5 IU/L, respectively), ALT (124.5 vs. 67 IU/L, respectively), and AFP (6.7 vs. 4.3 ng/mL, respectively) levels. In ETV group, the overall CVR rate during the follow-up period was 94.2%. A total of 161 of the 165 NA-naïve patients (97.6%) and 19 of the 26 NA-experienced patients (73.1%) achieved CVR (P = 0.057, [Figure 2]). Among the 19 NA-experienced patients who achieved CVR, 10 patients previously showed a suboptimal response, 7 patients were LMV-R, and 2 patients were ADV-R. The mean time to CVR was 13.5 ± 14.3 months. 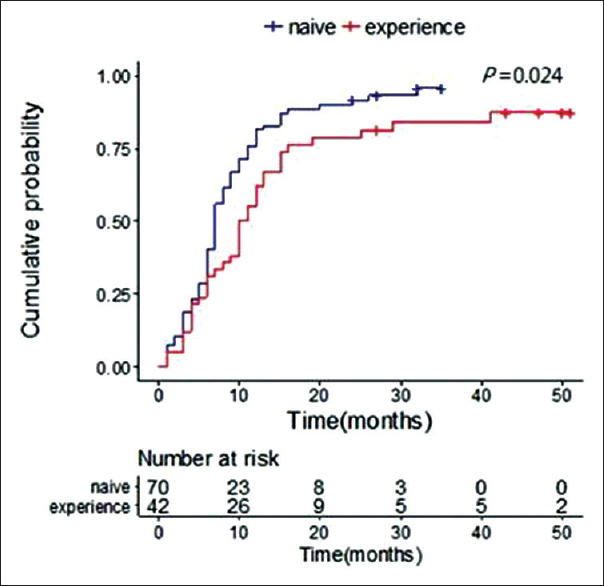 NA-experienced patients had a longer mean time to CVR compared to NA-naïve patients (20.7 ± 27.4 months vs. 12.3 ± 10.5 months, respectively, P = 0.138). CVR rate at 48 weeks was 84.1% (94.7% in NA-naïve patients and 71.4% in NA-experienced patients) in ETV group. CVR rates at 48 weeks were 80.8% in HBeAg-negative and 63.8% in HBeAg-positive patients. In TDF group, the overall CVR rate during the follow-up period was 91.1%. A total of 66 of the 70 NA-naïve patients (94.3%) and 36 of the 42 NA-experienced patients (85.7%) achieved CVR (P = 0.024, [Figure 3]). Among the 36 NA-experienced patients who achieved CVR, 12 patients previously showed a suboptimal response, 9 patients were LMV-R, 6 patients were ADV-R, and 9 patients were ETV-R. 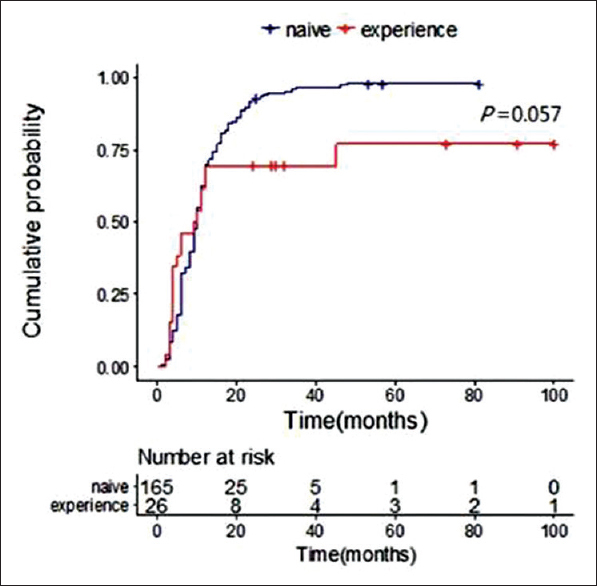 The mean time to CVR was 11.5 ± 10.6 months, and it was longer in NA-experienced patients than that in NA-naïve patients (15.0 ± 13.6 months vs. 9.4 ± 7.6 months, respectively, P = 0.018). CVR rate at 48 weeks was 81.4% (86.4% in NA-naïve patients and 72.2% in NA-experienced patients). CVR rates at 48 weeks were 92.0% in HBeAg-negative and 68.5% HBeAg-positive patients. 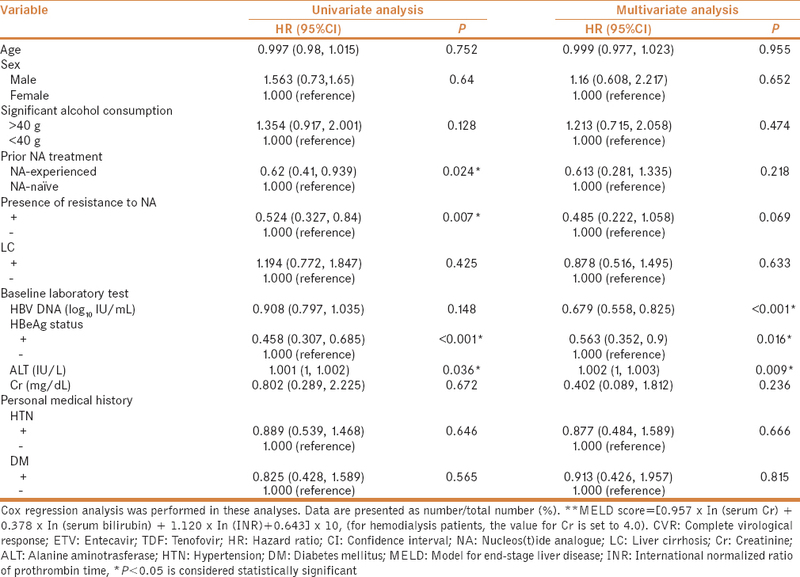 [Table 2] shows the results of univariate and multivariate analyses of predictive factors for CVR in ETV group. A total of 9 of the 14 NA-resistant patients (64.3%) achieved CVR. This was significantly associated with a low CVR when compared with that in patients who did not show resistance to NAs [hazard ratio (HR): 0.411; 95% confidence interval (CI): 0.208–0.813, P = 0.011] in univariate analysis but not in multivariate analysis (P = 0.722). A low HBV level was determined to be a positive predictive factor for CVR in both univariate (HR: 0.732; 95% CI: 0.643–0.833, P < 0.001) and multivariate (HR: 0.61; 95% CI: 0.488–0.762, P < 0.001) analyses. A positive HBeAg status was significantly associated with a low CVR in univariate analysis (HR: 0.599; 95% CI: 0.443–0.809, P < 0.001) but not in multivariate analysis (P = 0.687). A high ALT level was significantly associated with a high CVR in univariate analysis (HR: 1.001; 95% CI: 1–1.001, P < 0.03) but not in multivariate analysis (P = 0.128). 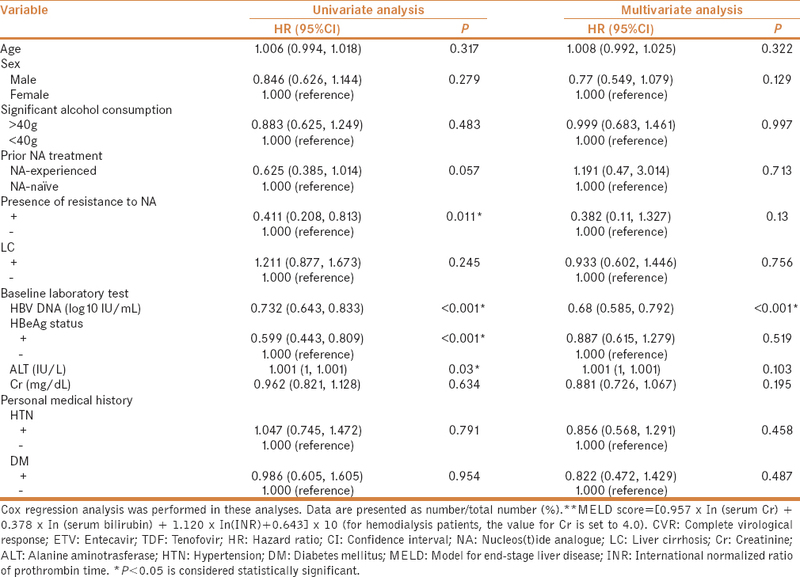 [Table 3] shows the results of univariate and multivariate analyses of predictive factors for CVR in TDF group. Although a prior NA treatment experience and resistance to NAs were significantly associated with a low CVR in univariate analysis (P = 0.024 and P = 0.007, respectively), they were not significant in multivariate analysis (P = 0.087 and P = 0.466, respectively). A low DNA level was associated with a high CVR in multivariate analysis (HR: 0.593; 95% CI: 0.465–0.756, P < 0.001). A positive HBeAg status was significantly associated with a low CVR in univariate (HR: 0.458; 95% CI: 0.307–0.685, P < 0.001) and multivariate analyses (P = 0.016). A high ALT level was associated with a high CVR in both univariate and multivariate analyses (P = 0.036 and P = 0.03, respectively). [Table 4] shows the data of univariate and multivariate analyses of factors associated with CVR in ETV and TDF treatment groups. The current treatment with a TDF was associated with high CVR (HR: 1.423; 95% CI: 1.01–2.005, P = 0.044). A total of 55 of the 68 patients (80.9%) who had prior NA treatment experience achieved CVR. This was significantly associated in univariate analysis with a low CVR when compared with that in patients who were naïve to NAs (HR: 0.67; 95% CI: 0.50–0.90, P = 0.009). Resistance to NAs was significantly associated with a low CVR in univariate (HR: 0.52; 95% CI: 0.36–0.75, P < 0.011) but not in multivariate analysis (P = 0.211). A low DNA level, negative HBeAg status, and high ALT level in the baseline laboratory test were associated with a high CVR in both univariate (P < 0.001, P < 0.001, and P = 0.01, respectively) and multivariate (P < 0.001, P = 0.048, and P = 0.024, respectively) analyses. [Table 5] shows the annual incidence rates of HCC and cirrhosis-related complications after antiviral therapy. A total of 13 of the 191 ETV-treated patients (6.8%) and 3 of the 112 TDF-treated patients (2.7%) developed HCC, and the annual incidence rates of HCC were 1.27% and 0.85% in ETV and TDF groups, respectively. However, the difference was not statistically significant (P = 0.526, [Figure 4]). Annual incidence rates of other cirrhosis-related complications, including variceal bleeding, ascites, SBP, and hepatic encephalopathy, were not significantly different between the two treatment groups either. In this real-world, single-center study, we investigated the efficacy of ETV and TDF treatment and complications that occurred during therapy. ETV and TDF are the only oral agents recommended as first-line therapy for CHB by many international guidelines. There have been some studies on efficacy and complications in ETV or TDF treatment groups ,,, and real-world single-center studies comparing ETV and TDF. However, real-world single-center studies that included various factors such as the rate of CVR, predictive factors for CVR, and occurrence of HCC and cirrhosis-related complications in both ETV and TDF treatment groups have been very limited. Among patients who received ETV in our study, the overall CVR rate during the follow-up period was high (94.2%), and the mean time to CVR was 11.0 ± 8.0 months. At 48 weeks, CVR rate was 84.1% in this group (94.7% in naïve vs. 71.4% in experienced patients). A phase 3, double-blind, multicenter study, which included 325 HBeAg-negative and 354 HBeAg-positive patients, has reported 90% CVR in the former and 67% CVR in the latter patients at 48 weeks., Only 3% of the patients in both HBeAg-negative and HBeAg-positive groups were treatment-experienced. In our study, CVR rates at 48 weeks were 80.8% in HBeAg-negative and 63.8% in HBeAg-positive patients. The results of our study showed a lower overall CVR rate at 48 weeks than that reported in a reference study because our study included more treatment-experienced patients, among which 12% were HBeAg-negative and 14.7% were HBeAg-positive. In case of TDF treatment, the overall CVR during the follow-up period was 91.1% in our study, and the mean time to CVR was 9.0 ± 6.8 months. At 48 weeks, CVR rate was 81.4% in this group (86.4% in naïve vs. 72.2% in experienced patients). A phase 3, double-blind, multicenter study which included 426 TDF-treated patients (250 HBeAg-negative and 176 HBeAg-positive) has reported 93% of CVR in HBeAg-negative and 76% CVR in HBeAg-positive patients at 48 weeks. The study included 17% of treatment-experienced patients in HBeAg-negative and 5% in HBeAg-positive group. In our study, CVR rates at 48 weeks were 92% in HBeAg-negative and 68.5% in HBeAg-positive patients. The results of our study showed lower overall CVR rate in HBeAg-negative patients at 48 weeks than that in a previous multicenter study because our study included more treatment-experienced patients, 43.1% in HBeAg-negative group. We evaluated predictive factors for CVR in ETV, TDF, and both treatment groups. In ETV, the treatment group, no resistance to NAs, a low HBV DNA level, negative HBeAg status, and high ALT level were significant predictive factors for CVR in univariate analysis, but only a low HBV DNA level was a predictive factor for CVR in multivariate analysis. A retrospective, multicenter cohort study, which included 533 ETV-treated patients, has been conducted in south-eastern Romania. The predictive factors for CVR in the study were a low score of fibrosis, low HBV DNA level, negative HBeAg status, and absence of prior IFN therapy. Our univariate analysis results were similar to those of a previous study, but only HBV DNA level was a significant predictive factor in multivariate analysis because our study did not evaluate fibrosis stage and had a short follow-up period. In TDF treatment group, NA-naïve status, no resistance to NAs, a negative HBeAg status, and high ALT level were predictive factors for CVR in univariate analysis, and a low HBV DNA level, negative HBeAg status, and high ALT level were predictive factors for CVR in multivariate analysis. In a Chinese multicenter retrospective study that included 102 TDF-treated patients (36 NA-naïve and 66 NA-experienced patients), HBV DNA level was the only significant predictive factor. In both treatment groups, the current treatment with TDF, a low HBV DNA level, negative HBeAg status, and high ALT level in baseline laboratory test were the predictive factors in multivariate analysis. There have been some studies of virological response after antiviral therapy and pretreatment ALT level as predictive factors., However, the mechanisms of the virological response and pretreatment ALT level are a matter of debate. In our study, the proportion of NA-naïve patients was larger than that of NA-experienced patients, and ALT level was higher in NA-naïve patients than that in NA-experienced patients because treatment guideline for NA-naïve patients includes high ALT levels. Therefore, there is a possibility that high ALT level in baseline laboratory test was a predictive factor in our study. Next, the annual incidence rates of HCC were 1.27% in ETV treatment group and 0.85% in TDF treatment group, but the difference was not significant (P = 0.526). Recently published reports have shown that the annual incidence rates of HCC in ETV- or TDF-treated patients ranged from 0.01% to 5.4%.,, Although these results are similar to those of our study, there are limitations not allowing an accurate evaluation of the incidence rate of HCC in our study because the number of patients was too small and the follow-up period was too short. Our study evaluated the presence of cirrhosis-related complications, including varices, variceal bleeding, ascites, SBP, and hepatic encephalopathy after ETV or TDF medication. 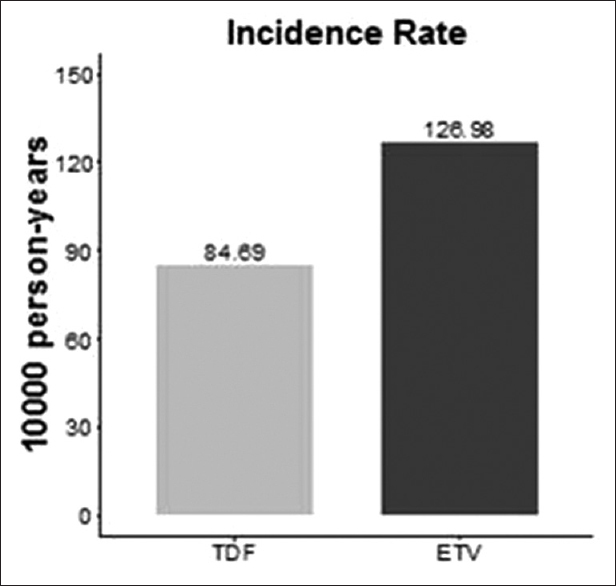 Annual incidence rates of complications ranged from 0.28% to 2.49%, and the differences were not significant between ETV and TDF groups. Data were similar to those of a retrospective single-center study which included 180 ETV-treated patients and 220 TDF-treated patients  and reported that the annual incidence rate of complications was 0.5%. As our study was retrospective, we did not analyze the changes in complication rate before and after antiviral therapy. These complications are not common, and their occurrence is too rare to compare our data with those of other studies. There are some limitations to our study. First, the study was conducted in a single-center, and the number of patients was small and without a control group. Second, not all patients who developed HCC and cirrhosis-related complications visited our hospital; therefore, it is possible that the number of such patients was underestimated. The compliance of patients was not checked. Third, the observation periods were different between the two treatment groups. The observation period in TDF group was shorter than that in ETV group because TDF has been only recently (end of 2012) approved for treatment of patients with CHB in Korea. The total observation period was short to see long term effects of treatment and HBV-related complications during treatment. Finally, when diagnosing cirrhosis, we did not evaluate fibrosis stage of the liver. Both ETV and TDF therapy resulted in a high CVR, and the annual incidence rates of HCC and other cirrhosis-related complications were not significantly different between the two treatment groups. Hong WS. Seroepidemiology of type A and type B hepatitis in Seoul area. Korean J Intern Med 1982;25:19-26. Jang KM, Woo SH, Yun DH, Lee KR, Kwon YO, Kang JY, et al. Seroepidemiologic survey on type B viral hepatitis in Inchon area. Korean J Intern Med 1983;23:1331-6. Jang MK, Lee JY, Lee JH, Kim YB, Kim HY, Lee MS, et al. Seroepidemiology of HBV infection in South Korea, 1995 through 1999. Korean J Intern Med 2001;16:153-9. Joo KR, Bang SJ, Song BC, Youn KH, Joo YH, Yang S, et al. Hepatitis B viral markers of Korean adults in the late 1990s: Survey data of 70,347 health screenees. Korean J Gastroenterol 1999;33:642-52. Ministry of Health and Welfare, Korea Center for Disease Control and Prevention. Korea Health Statistics 2010: Korea National Health and Nutrition Examination Survey (KNHANES V-1). City; Korea Center for Disease Control and Prevention; 2011. p. 731. Cheon JH, Park JW, Park KW, Kim YI, Kim SH, Lee WJ, et al. The clinical report of 1,078 cases of hepatocellular carcinomas: National Cancer Center experience. Korean J Hepatol 2004;10:288-97. Kim CY, Kim JW, Lee HS, Yoon YB, Song IS. Natural history and survival rate of chronic liver diseases in Korea: 20 years prospective analysis. Korean J Med 1994;46:168-80.
van Zonneveld M, Flink HJ, Verhey E, Senturk H, Zeuzem S, Akarca US, et al. The safety of pegylated interferon alpha-2b in the treatment of chronic hepatitis B: Predictive factors for dose reduction and treatment discontinuation. Aliment Pharmacol Ther 2005;21:1163-71. Sonneveld MJ, Rijckborst V, Boucher CA, Hansen BE, Janssen HL. Prediction of sustained response to peginterferon alfa-2b for hepatitis B e antigen-positive chronic hepatitis B using on-treatment hepatitis B surface antigen decline. Hepatology 2010;52:1251-7. Langley DR, Walsh AW, Baldick CJ, Eggers BJ, Rose RE, Levine SM, et al. Inhibition of hepatitis B virus polymerase by entecavir. J Virol 2007;81:3992-4001. Dienstag JL. Hepatitis B virus infection. N Engl J Med 2008;359:1486-500. Harris RA, Chen G, Lin WY, Shen FM, London WT, Evans AA. Spontaneous clearance of high-titer serum HBV DNA and risk of hepatocellular carcinoma in a Chinese population. Cancer Causes Control 2003;14:995-1000. Lok AS, McMahon BJ, Brown RS, Jr., Wong JB, Ahmed AT, Farah W, et al. Antiviral therapy for chronic hepatitis B viral infection in adults: A systematic review and meta-analysis. Hepatology 2016;63:284-306. Idilman R, Gunsar F, Koruk M, Keskin O, Meral CE, Gulsen M, et al. 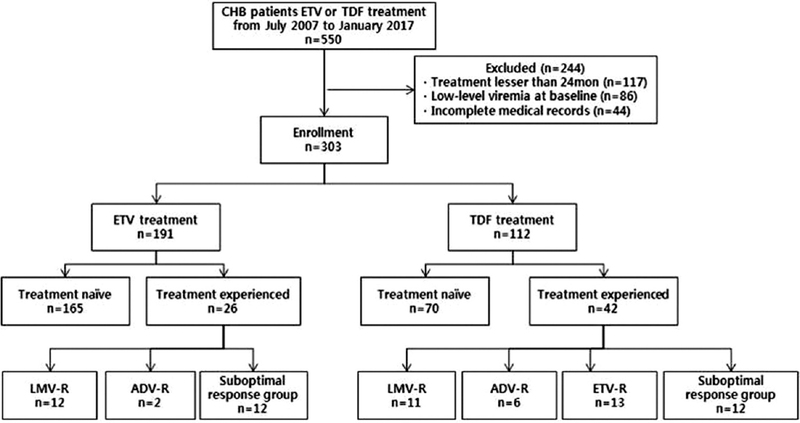 Long-term entecavir or tenofovir disoproxil fumarate therapy in treatment-naive chronic hepatitis B patients in the real-world setting. J Viral Hepat 2015;22:504-10. Lovett GC, Nguyen T, Iser DM, Holmes JA, Chen R, Demediuk B, et al. Efficacy and safety of tenofovir in chronic hepatitis B: Australian real world experience. World J Hepatol 2017;9:48-56. Chen CF, Lee WC, Yang HI, Chang HC, Jen CL, Iloeje UH, et al. Changes in serum levels of HBV DNA and alanine aminotransferase determine risk for hepatocellular carcinoma. Gastroenterology 2011;141:1240-8, 48.e1-2. Sinn DH, Lee J, Goo J, Kim K, Gwak GY, Paik YH, et al. Hepatocellular carcinoma risk in chronic hepatitis B virus-infected compensated cirrhosis patients with low viral load. Hepatology 2015;62:694-701. Taylor-Robinson SD, Foster GR, Arora S, Hargreaves S, Thomas HC. Increase in primary liver cancer in the UK, 1979-94. Lancet 1997;350:1142-3. 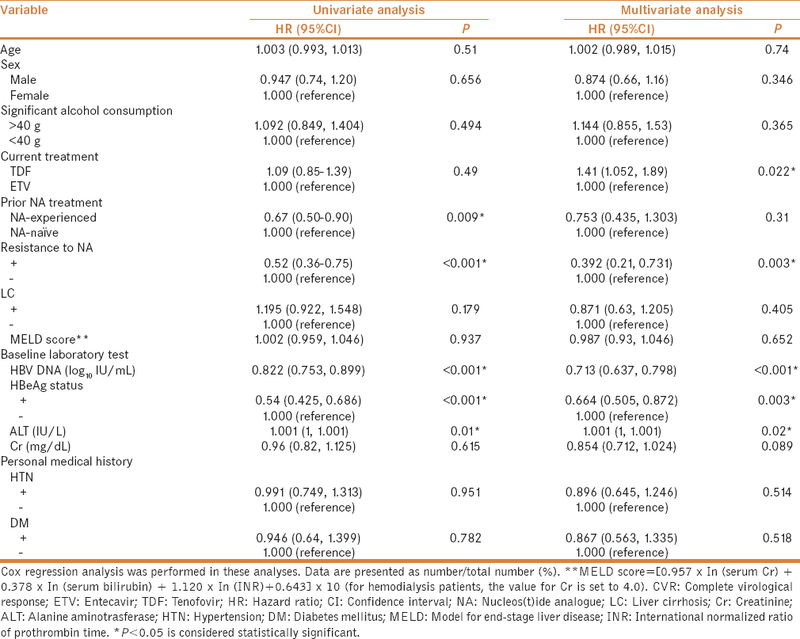 Umemura T, Ichijo T, Yoshizawa K, Tanaka E, Kiyosawa K. Epidemiology of hepatocellular carcinoma in Japan. J Gastroenterol 2009;44(Suppl. 19):102-7. Myung HJ, Jeong SH, Kim JW, Kim HS, Jang JH, Lee DH, et al. [Efficacy and predictors of the virologic response to entecavir therapy in nucleoside-naive patients with chronic hepatitis B]. Korean J Hepatol 2010;16:57-65. Lai CL, Shouval D, Lok AS, Chang TT, Cheinquer H, Goodman Z, et al. Entecavir versus lamivudine for patients with HBeAg-negative chronic hepatitis B. N Engl J Med 2006;354:1011-20. Chang TT, Gish RG, de Man R, Gadano A, Sollano J, Chao YC, et al. A comparison of entecavir and lamivudine for HBeAg-positive chronic hepatitis B. N Engl J Med 2006;354:1001-10. Marcellin P, Heathcote EJ, Buti M, Gane E, de Man RA, Krastev Z, et al. Tenofovir disoproxil fumarate versus adefovir dipivoxil for chronic hepatitis B. N Engl J Med 2008;359:2442-55. Cho EJ, Lee JH, Cho Y, Lee YB, Yoo JJ, Lee M, et al. Comparison of the efficacy of entecavir and tenofovir in nucleos (t) ide analogue-experienced chronic hepatitis B patients. PLoS One 2015;10:e0130392. Preda CM, Baicus C, Negreanu L, Tugui L, Olariu SV, Andrei A, et al. Effectiveness of entecavir treatment and predictive factors for virologic response. Rev Esp Enferm Dig 2014;106:305-11. Huang M, Lin G, Shi H, Wu Y, Jie Y, Zhu Z, et al. TDF monotherapy is effective regardless of prior nucleos(t)ide analogue treatment in chronic hepatitis B patients in China. Biomed Res Int 2017;2017:2463197. Perrillo RP, Lai CL, Liaw YF, Dienstag JL, Schiff ER, Schalm SW, et al. Predictors of HBeAg loss after lamivudine treatment for chronic hepatitis B. Hepatology 2002;36:186-94. Chien RN, Liaw YF, Atkins M. Pretherapy alanine transaminase level as a determinant for hepatitis B e antigen seroconversion during lamivudine therapy in patients with chronic hepatitis B. Asian Hepatitis Lamivudine Trial Group. Hepatology 1999;30:770-4. Lampertico P, Soffredini R, Viganò M, Minola E, Cologni G, Rizzi M, et al. 755 5-year entecavir treatment in NUC-naïve, field-practice patients with chronic hepatitis B showed excellent viral suppression and safety profile but no prevention of HCC in cirrhotics. J Hepatol. 2013;58:S306-S07. Lampertico P, Soffredini R, Yurdaydin C, Idilman R, Papatheodoridis GV, Mar-gariti E, et al. Four years of tenofovir monotherapy for NUC naïve field practice European patients suppresses HBV replication in most patients with a favorable renal safety profile but does not prevent HCC in patients with or without cirrhosis. Hepatology 2013;58:653A.